Literature has the power to change perspectives, to challenge thinking and to widen worlds. This book does all that and more. Auggie looks different. He was born that way. But on the inside, he is just a kid who wants to ride his bike, eat ice cream and play ball. Many of you will be familiar with R J Palacio’s phenomenal novel, Wonder, which introduced middle grade kids to Auggie. We’re all Wonders introduces Auggie to a younger audience. And it couldn’t be more timely or topical. This powerful and important picture book is a must read. Auggie’s mum thinks he’s a wonder. So does his dog, Daisy. But what do others think? How does Auggie feel when people stare, or point, or laugh? He knows he doesn’t look like other kids, but that doesn’t mean it doesn’t hurt when people talk behind his back. Auggie is resilient. When Auggie feels down, he and Daisy put on their helmets and blast off into outerspace. They look down at Earth, with its billions of people. ‘People of all different colours. People who walk and talk differently. People who look different. Like me!’. Even though he can’t change who his is, Auggie knows he is special. The illustrations have a beautiful use of colour and tone. Auggie is prominent on each page with his bright red T shirt against a backdrop of more subtle shades. For a character with no facial expressions, it is amazing how well Auggie's feelings are conveyed through gesture and pose and the rich detail in the seemingly simple backgrounds. R J Palacio has created a poignant story and relatable character that will open conversations and welcome difference. I hope that schools embrace this book as it will introduce kids to difference, empathy and belief in self, as well as supporting some of those challenging conversations that need to be had. 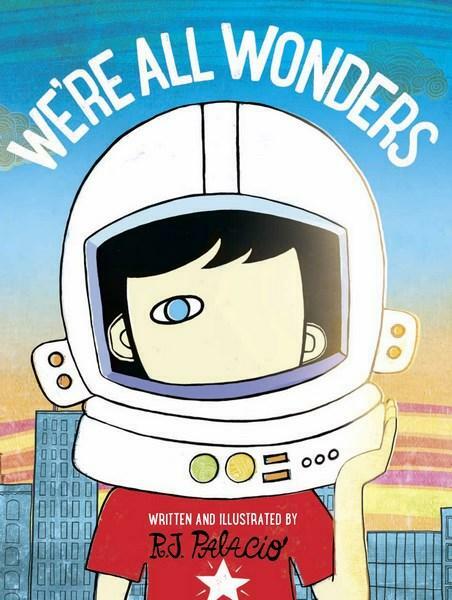 We're all Wonders opens kids up to different ways of looking at the world in a beautiful and honest way. And the important realisation that we can’t change who we are, but ‘people can change the way they see’. Everyone is an individual, everyone is special. On the inside, ‘We’re all Wonders’. Look with kindness and you will always find wonder.